In the middle of May, 2014, Sarajevo experienced the worst flooding in more than a century. I remember standing by the Miljacka River watching the rush of water and expecting at any moment the banks to breach, flooding the old town. They held there, though there was devastation downstream. It took some ingenuity to get out of Bosnia that day, but I’ll never forget the sheer force of that river. 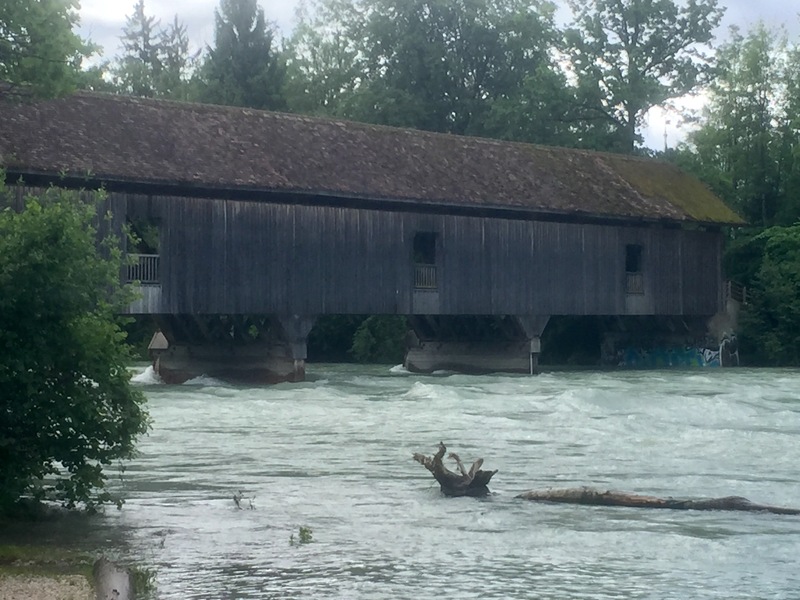 This morning over breakfast at the B&B, a fellow guest commented on how dangerous the Aare River was. Soon Bennett and I found ourselves on the banks of that flooding river, walking on a path by the embankment wondering how high the waters would rise. 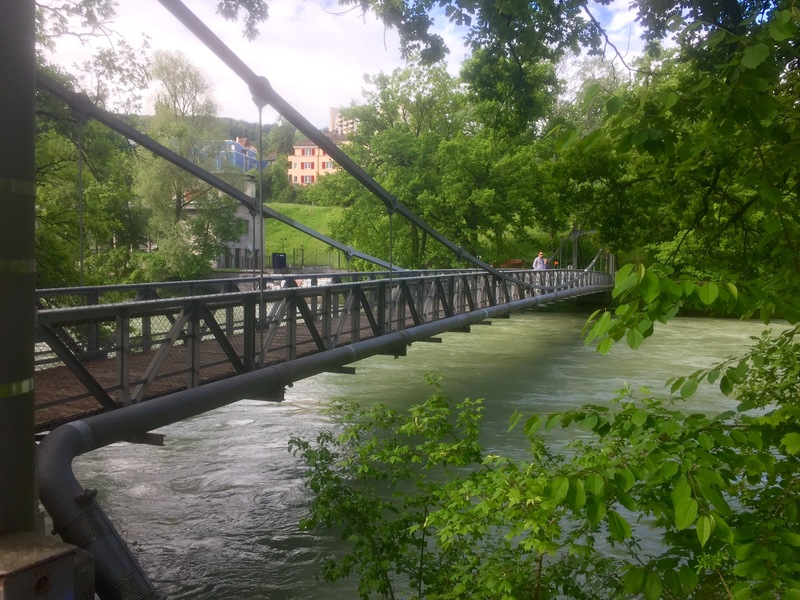 Across we could see steps and handrails that in normal circumstances led people to the water, but today they were nearly submerged as the water rushed past.Today’s walk started with about 10km along that river on a well-made path that for a while ran through the zoo. We speculated about where the chamois and goats would go if the waters continued to rise, but the rain held back and decent weather prevailed. We only found one slightly over-washed stretch and emerged with barely wet shoes (nothing like the Te Araroa). The rest of the day we climbed a ridge, then crossed a river valley occasionally glimpsing through parted clouds high snow-capped mountains. Most of today though remained in the barnyard that is this region. One thing I have been struck by are the dairy herd bells. While many have what we would call traditional tin cowbells hung from their necks, many wear cast bronze (?) bells looking like 4″ diameter bells that might be rung in a church or at a recital. When a large herd of dairy cattle converge for milking, you can hear the clanging for miles. To make up for our slack yesterday, we pushed hard today, making it to the village of Lützelflüh famous for the Swiss writer Jeremias Gotthelf. A pleasant evening at Italian restaurant and resting some weary bones.